Effective communication, conflict resolution as well as spiritual, emotional and physical intimacy are key to a successful marriage. 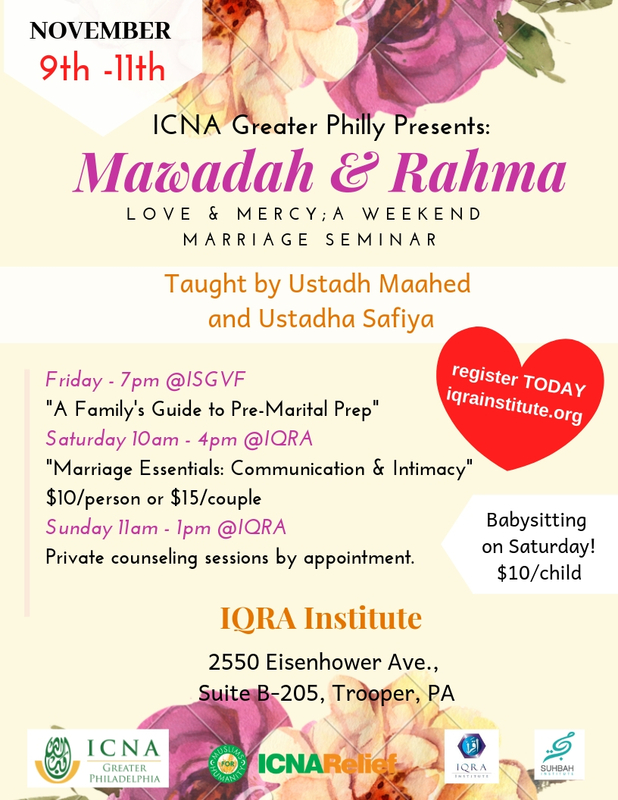 Learn how the Prophet (S) dealt with conflict in his marriage, the advices he gave to encourage intimacy between spouses, and learn practical tips and skills to ensure better communication and problem solving in marriage. Mahad Qamar and Safiya Ravat are an American couple from Houston, TX. Mahad serves as the Imam and Safiya serves as the female religious director at Maryam Islamic Center. They graduated from the Bayyinah Dream Program and then went on to complete a Bachelor’s Degree in Fiqh and Usul ul Fiqh (Shariah) from the International Islamic University of Malaysia (IIUM). They are both certified Pre-Marital Training facilitators in both the Prepare/Enrich and SYMBIS curriculums, and are currently pursuing their Master’s degrees in Pastoral Counseling in Marriage and Family. Both Mahad and Safiya were the head instructors at the Bayyinah Dream Quranic Arabic Program, and have been teaching classes and offering seminars nationally and internationally for almost 10 years on the recitation of the Quran, Interactive Discussion-based Quran Study, Women’s Fiqh, Marriage Preparation, Names and Attributes of Allah, the life of the Prophet Muhammad (s) and the Arabic language to audiences of all ages.